For a Fistful of Grain . . . The Midwest is the fifth volume of an ambitious project by your American Autoduel Association. The AADA Road Atlas and Survival Guide will tell you everything you need to know about each region, including the roads, politics, police, tourist attractions, AADA advisories, as well as the best restaurants and truck stops. A complete description of the three types of Fortress Towns that protect citizens from marauding gangs. 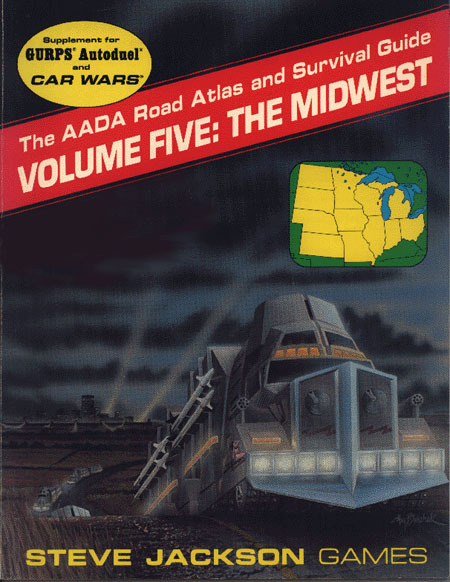 Campaign guidelines for GURPS Autoduel GMs, with advice for setting an adventure in any part of the Midwest. Mini-adventures for Car Wars or GURPS, each set in a different part of the region. "Murphys' Law," a complete adventure for GURPS Autoduel. The Murphys have struck a blow for human freedom against the accursed machines of KC-1. You are caught in the middle, and the only way to buy your own personal freedom lies in a chase across the Midwest. Can you stop the Murphys before they produce a bigger bang than they bargained for? GURPS Autoduel – A world devastated by war, famine and despair . . . on lawless highways where the right of way goes to the biggest guns.